"O Ganges, O Yamuna, O Godavari, O Saravati, O Narmada, O Sindhu, O Kaveri, please become present in this water." Take the remaining tilak, and wipe it on the back of the head, in the area of the sikha, and chant om vasudevaya namaha. Lord Shiva says to Parvati that in the middle of the tilak marking there is a space, and in that space reside Lakshmi and Narayana. 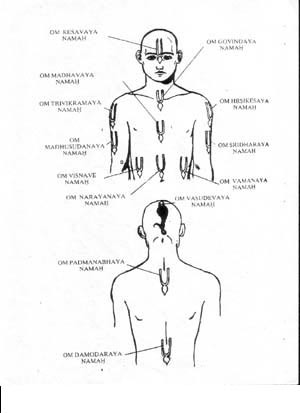 Therefore the body that is decorated with tilaka should be considered a temple of Lord Vishnu.